Invert dough rectangle directly onto grill rack; peel off foil and return foil to cookie sheet, sprayed side up. Cook uncovered over medium-low heat 2 to 4 minutes or until bottom is golden brown. (Watch carefully to prevent burning.) With wide metal pancake turner, turn crust over. Cook 1 to 2 minutes longer or until bottom is set but not brown. Carefully remove from grill; place browned side up on foil. Close grill. 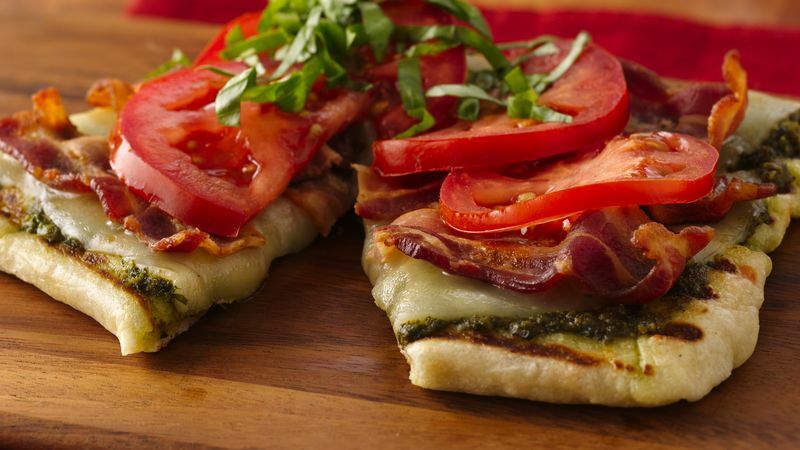 Top crust evenly with pesto and cheese. Return to grill; cover grill and cook 2 to 5 minutes longer or until cheese is melted. Remove from grill; cut into quarters. Top each quarter with bacon, tomato and basil. Use precooked bacon and make this sandwich even faster.